This article first appeared in The Edge Malaysia Weekly, on September 4, 2017 - September 10, 2017. EVEN as Malaysia declared that it is hosting the final Formula One Grand Prix at the Sepang International Circuit in September 4 after a 19-year run, national oil company Petroliam Nasional Bhd (Petronas) announced in July its second contract extension as title partner of the Mercedes-AMG Petronas Motorsport F1 Team, this time until 2020. Inadvertently, questions are raised as to why it has decided to stay in the sport. The extension came at a time when Petronas is still in a recovery mode after being hit by the oil price slump in 2015, critics say. Additionally, it is said that Petronas already had the global footprint it eagerly sought, compared to when it first entered F1 with Red Bull Sauber in 1995. When making the announcement, Petronas group president and CEO Datuk Wan Zulkiflee Wan Ariffin said its participation in F1 is still key to its global branding, and he opined that the benefit will only increase over time. “I think this year, there’s new vitality, there’s a new level of energy in the sport. With the many new things that are being made available to the fans, I sense that viewership will increase and I think that’s great,” he said. From a marketing perspective, Petronas is backing the right team. Mercedes-AMG Petronas has clinched the most podiums each season in the past three years (from 2014 to 2016) — all record highs — with an all-time record of 12 one-two finishes in 2015. Mercedes-AMG Petronas F1 Team executive director Torger Christian Wolff says the Petronas brand has grown from being known by just “a few insiders” prior to its partnership with the team in 2010 to the most recognised one in the F1 fraternity in the last two years. “For me, this (the extension) is normal. Anything else would have been not normal. Why would you end the relationship as it is? Petronas has been part of the turnaround [to become a winning team] and the great times we’ve had in the past,” Wolff says in an interview. Petronas reportedly said the F1 venture helped it earn US$901.08 million (RM3.7 billion) in global media exposure (GME) during the 2015 season. GME is a figure used to measure brand exposure from global live and repeat broadcast — in this case, of the F1 races. F1 recorded a global viewership of 400 million in 2015, which is considered a low base for the sport’s overall GME. It was the sixth and final year of consecutive decline in global television viewership from 527 million in 2009, according to data from F1 official broadcast management unit Formula One Management. Global viewership was flat year on year last year, but is expected to pick up this year as the competition between Mercedes-AMG Petronas and Scuderia Ferrari on the race tracks intensifies, which will indirectly boosts Petronas’ marketing reach. The trickle-down effects of the F1 marketing, which have doubled with the recent dominance by the Silver Arrows, have helped Petronas post extensive growth in its lubricant sales in Europe, where the sport is still widely followed. As at April this year, Petronas’ lubricant arm, Petronas Lubricants International (PLI), rose to become the world’s No 10 lubricant player in terms of market share, from No 15 in 2015. With 10 blending plants and a production capacity of 600,000 tonnes per year and growing, PLI aspires to be among the top five lubricant players in the world by 2019. At present, the European market contributes 28% to PLI’s revenue. The group’s other key markets include Latin America, Southeast Asia, South Africa, China and India. It plans to embark on capacity expansion in these countries and regions in the next couple of years. Petronas’ 80%-owned Engen SA is also banking on the former’s dominance in F1 by having its “Put a little F1 in your tank” marketing campaign this year. The South African retailer currently sells Primax fuel and Petronas lubricants in 26 countries. Thus far, the benefits of being in the motorsport seem attractive. But is it worth the investment? 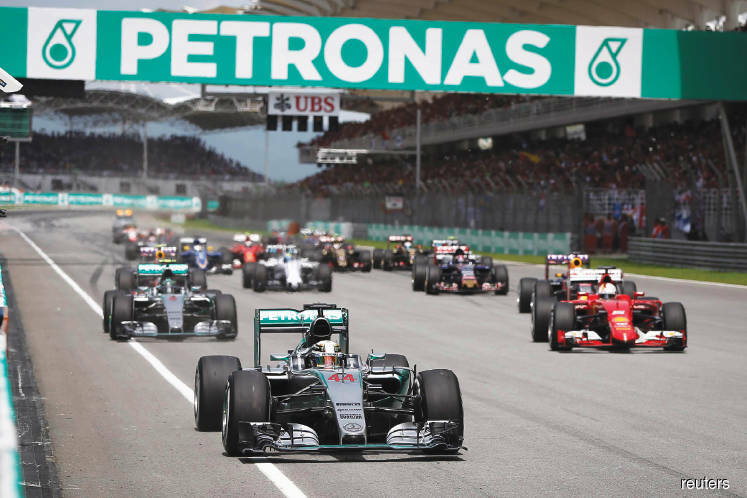 Mercedes-AMG Petronas F1 Team brought in US$316.1 million in revenue during the 2015 season. However, none of it went to Petronas as the company’s fund injection is more on a sponsorship basis. In contrast, the racing team has indicated that it is running on a budget of £160,000 (RM883,000) per lap this year, giving it a ballpark figure of at least £183.04 million for the 2017 season. However, it is worth noting that the Mercedes-AMG engine is used by four F1 teams this year. As it can only perform at its best with Petronas’ products, the other three teams are bound to buy fuel and lubricants from the Malaysian firm. The tie-up with Mercedes has also led to Petronas being the factory fill for selected Mercedes models in Malaysia and parts of Europe. These two sources of income are indirectly derived from its F1 involvement and will help recover some of the investment costs in the sport. The value of Petronas’ extended contract with the Silver Arrows was not announced. The initial contract — between 2010 and 2014 — reportedly cost Petronas an estimated €30 million (RM153.5 million) each year while the first extension to this year is said to be worth just over €35 million annually. The sponsorship is roughly one-sixth of the team’s total budget, which is minuscule in comparison to Petronas’ annual earnings. Additionally, the Sepang exit will definitely remove a big chunk of F1 sponsorship spending from Petronas’ books. As for its financial performance, Petronas saw a third consecutive year of decline in both revenue and profit before tax (PBT) in its financial year ended Dec 31, 2016 (FY2016). PBT was down 8.25% y-o-y to RM33.66 billion, dragged by lower realised product prices and sales volume. Revenue was 17.26% lower at RM204.91 billion. Indeed, Petronas’ FY2016 net profit of RM16.95 billion was less than a third of the RM59.69 billion it made in 2011 when oil prices first hit an annual average of US$100 per barrel. Meanwhile, it has other less synergistic sponsorship investments in hand. For example, it allocated RM15 million to become the platinum sponsor for the 2017 Kuala Lumpur SEA Games — an area that is totally unrelated to vehicles or fuel and lubricant research and development. Sponsorship is part and parcel of business, especially for companies with a big footprint and those that see branding as a key growth driver. In Petronas’ case, many believe that it would be a shame if it closes the door on Formula One altogether as the intangibles from its involvement could very well outweigh the ringgit and sen spent.